It was sewn entirely by me! Excepting shoes (brown oxfords, not shown) and tights, which don’t count. 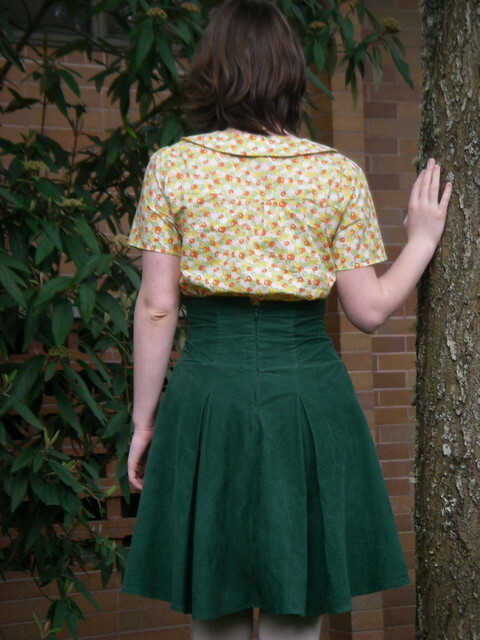 The skirt you’ve seen before–it’s my green corduroy one I made last summer, though it has been taken in since. But the blouse is new! It is a Colette Violet, made up in the cutest fabric you ever did see. It has been sitting in the closet awaiting buttons for at least two weeks, and I finally got around to them last night at a sewing party. 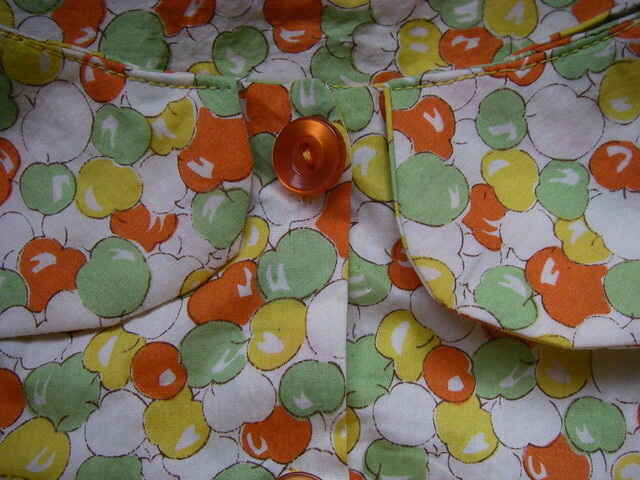 You can’t tell from this photo, but I couldn’t find enough matching orange buttons, so they are slightly different. 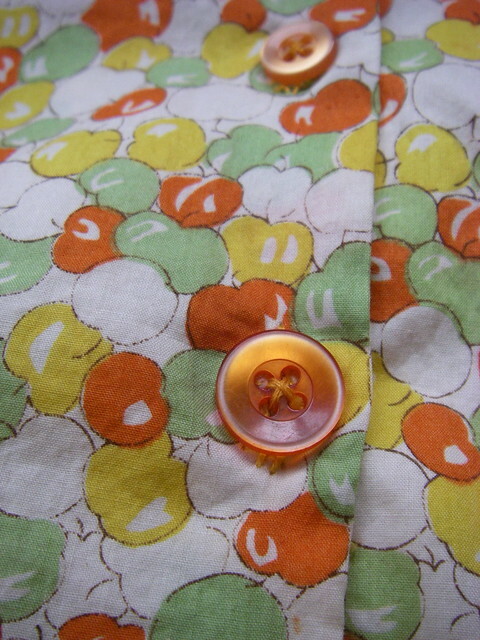 It’s barely noticeable, though, and if anyone did notice, I think the print can pass it off as “whimsy.” There are also nine buttons, instead of the six or seven that the pattern called for, and I regretted it long before I had finished hand-sewing each buttonhole. When I had pinned it together, it pulled at the bust, and my nine buttons were meant to prevent gaping, but in fact there is room and to spare in the finished product. 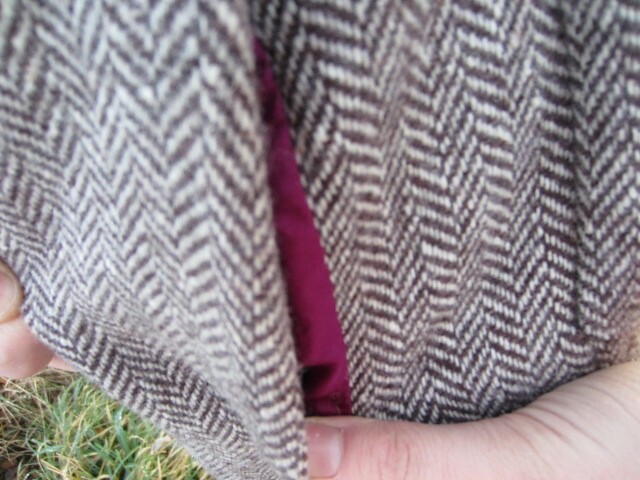 I later learned that I can pull it over my head, and the buttonholes are utterly unnecessary. 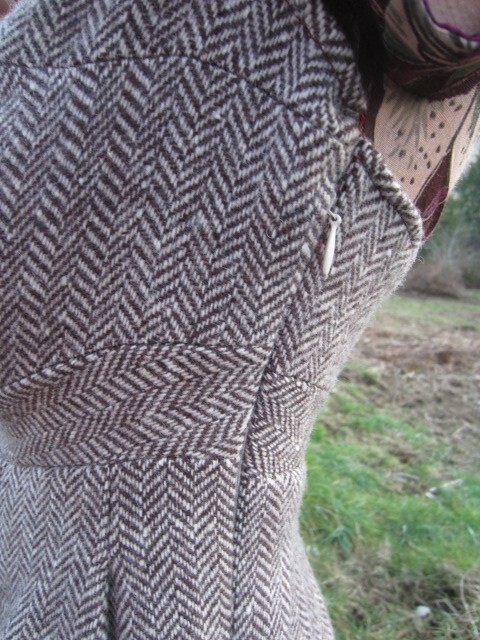 Collar detail. I love the collar, and there’s enough of this fabric left over for a few details on some sweet cream-colored dress. 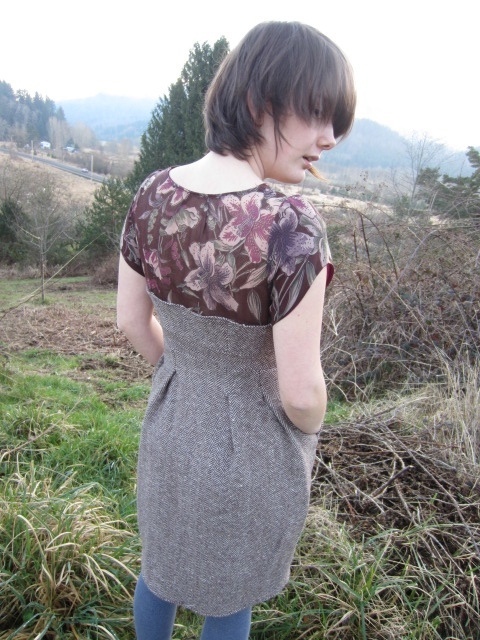 I made no alteration to this pattern, just traced it off in a size 0 and made it up, with only the minimum possible tissue fitting (that is, “is this going to fit over my bust? yeah, looks like it, let’s go”). I thought about making a muslin, but for such a simple pattern I didn’t really think that it could fit me that terribly. I don’t exactly regret making a muslin, but there are definitely some alterations I will make for next time; this version is a bit too voluminous in places. And untucked. It really looks best tucked in, it is just a little too big and a little too boxy to be really flattering, though it might be cute with jeans or a straight skirt. In my next version, I will probably take out about an inch of length in the high bust, and maybe a quarter to half an inch in the shoulders. I might also take out an inch of length along the lengthen/shorten line, because looking at other people’s Violets, they do seem to be a bit shorter than mine, and I will probably end up hemming mine a little more–I am, after all, quite petite. I am also considering taking the next one in at the side seams. 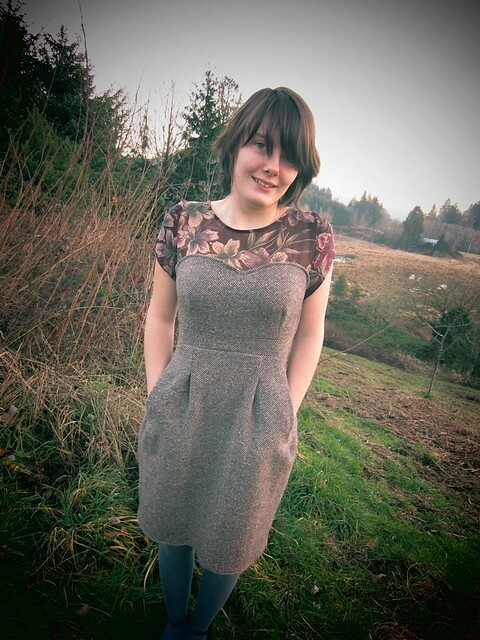 A lot of this depends on how I feel as I wear this one, but I already have plans for another in white lawn with purple accents–it’s a very cute and easy pattern, and it seems a shame to let a small sizing problem get in the way. 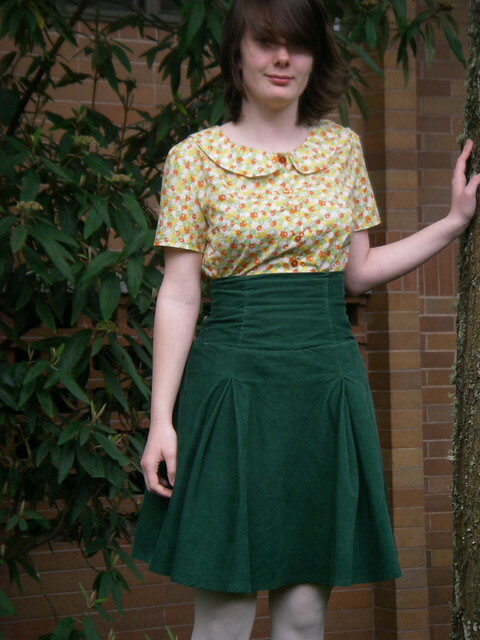 Of course, if I keep making Violets I’ll have to keep making high-waisted skirts! 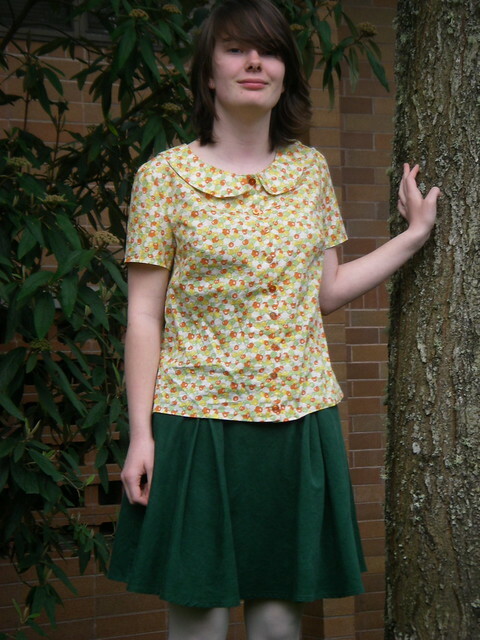 I really only have a couple skirts that I feel I can wear blouses with, especially blouses this blousy. Overall, though, I’d call it a success! 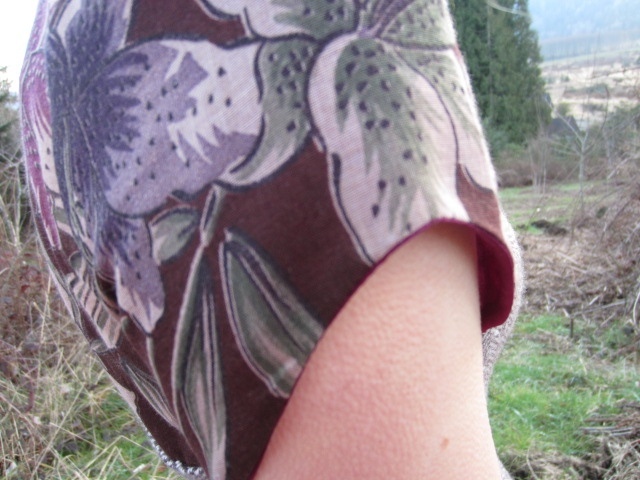 The cut and colors are very summery and light, but the print is a bit more autumnal, so it’ll be relevant all year round! This entry was posted in outfits, sewing and tagged blouse, colette, exciting new clothes!, handsewn, ootd, sewing on April 8, 2013 by Alice. 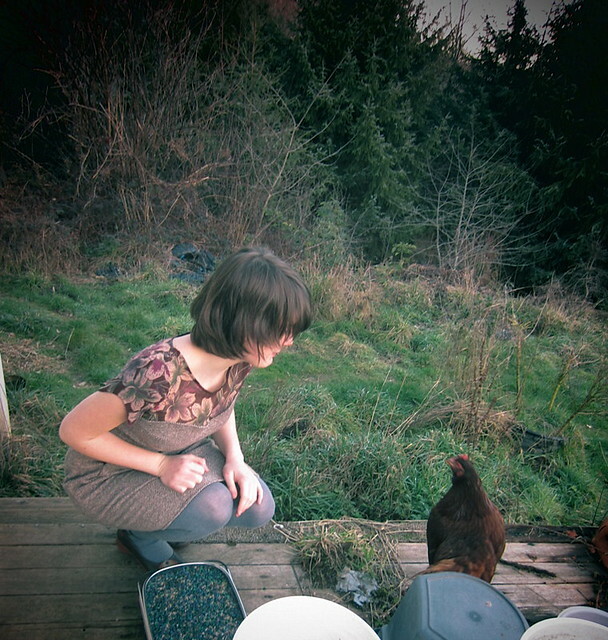 This entry was posted in sewing and tagged chicken, colette, dress, exciting new clothes!, floral, handsewn, macaron, patterns, sewing on January 16, 2013 by Alice.